RUSSIA BEYOND THE HEADLINES is proud to present its new weekly analytical program “TROIKA REPORT,” featuring a look at three of the most high-profile recent developments in international affairs. The three-course meal will be digested for your sake by Vladimir Mikheev, and also salted and peppered by an array of guest analysts. We bring you the hot geopolitical stories which have made the headlines over the last seven days, stratified into three sections: Engaging the West, Globally speaking, and Going Eastward. Greece gambles on Moscow: Will it pay off? 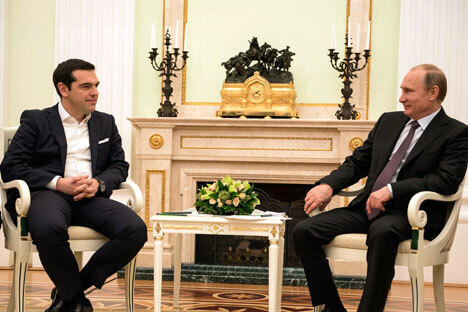 On the 8th of April, the EU’s new political iconoclast, Greek Prime Minister Alexis Tsipras, visited Moscow and met with Russian President Vladimir Putin. By doing so, the young and charismatic Greek leader sent an unequivocal signal to the European Union but mostly to the troika of international creditors, the European Commission (EC), the European Central Bank (ECB) and the International Monetary Fund. The message is clear: If pressured too hard, the nation which gave birth to democracy as a model of governance will turn to other sources of diplomatic and possibly financial support. Greece has been the most vociferous European nation in voicing its disagreement with the EU policy of estranging Russia thorough economic and financial sanctions –a policy which paved the way to Moscow for PM Tsipras, almost ensuring the red carpet treatment. But was it enough to guarantee Greece a weighty prize to take away? It all depended on the scope of the tasks set a priori by the Greek leadership. According to sources in Athens in contact with TROIKA REPORT, originally the Greek delegation had three very simple and pragmatic goals. Firstly, to cut the fine for failure to meet the take-or-pay obligation during the purchase of gas from Gazprom from 100 to 50 million euros. Secondly, to plea for a 10 percent discount for Russian gas for the current year. Mind you, this is no small beer: Greece depends on Russian pipeline supplies for 65 percent of its gas. Thirdly, to ask Moscow to lift the food embargo which has seen Greek peaches and strawberries, earmarked for the Russian market, rot, leading to 30-35 million euros in losses last year. “My opinion is that Russia, of course, is an important partner for Greece. Still Russia is, to a certain extent, undiscovered terrain, an undiscovered land for Greece. Many experts, Greek and Russian alike, have been saying that Turkey has the initiative in the relationship with Russia while Greece is lagging behind and is not making use of the opportunities in relations with Russia…Russia is aiming at acquiring Greek railroads and infrastructure related to gas. The new Greek government is trying to work out what its alternatives are. But isn’t there a nagging feeling that something is missing? The agenda of the talks Mr. Tsipras held in Moscow looks pretty mediocre and routine. Gas supplies counterweighted by deliveries of strawberries. Trade in general and Greece as a tourist destination. Russian investors to target the sell-off of Greece’s “family silver.” This is all suspiciously devoid of intrigue. Is there more than meets the eye? It’s our understanding at TROIKA REPORT that part of the high-level discussions must have focused on the financial side of the contemporary Greek tragedy. Time is running out for Athens: The bailout deal expires in late June. The troika of international lenders is unhappy with Greece’s constant hints that if the going gets really tough, the country may default on its foreign debt, flee the eurozone and resurrect its centuries-old currency, the drachma. Officially, Tsipras’s government says the opposite, but doubts persist, and the warnings from the EU not to dump the euro are as abundant as they are menacing. In these dire circumstances, it is all too probable that Alexis Tsipras used his trip to Moscow to test the water: Could Russia serve as an alternative source of bail-out money? Tsipras most likely came to the conclusion that Moscow is in no position to salvage anyone but itself right now. Cash-strapped and subject to Western sanctions, with global finances being used as a political weapon against it, Russia would be unable to substitute the troika as a financial donor. That said, there is no reason to underestimate the symbolic significance of the visit to Moscow by the Greek political maverick, who is almost certain to continue to rock the European boat by playing either the Russian or the Chinese card. After all, since the European policy of austerity as the only cure for a severely ill Greek economy is not delivering, Athens will keep looking for any plausible alternatives. The continuous bombardment of Houthi rebels by the Saudi Arabia-led coalition has placed Yemen on the global map of hotspots. Moscow has joined other nations in appealing to the warring parties to agree to a ceasefire and sit down at the negotiating table, but to no avail. The purely internal feud has been interpreted by the neighboring oil superpower as a hideous plot, masterminded by the Iranians, with the covert goal of destabilizing the House of Saud, provoking the Shiite majority in the eastern province into sedition, installing a pro-Iran ruler in Yemen, and threatening to block one of the main sea lanes for Saudi oil exports by taking control of the strategic Red Sea Bab el-Mandeb strait. Fearful of encirclement, Riyadh is contemplating the unthinkable: On top of airstrikes it plans to launch a land operation. Saudi Arabia and some Gulf monarchies are ready to table a resolution in the United Nations Security Council to legitimize a military incursion into Yemen. “International law has been violated in Yemen. Russian Foreign Minister Sergei Lavrov said in his interview to RIA Novosti that Russia was taken aback by the attack of the Saudi-led coalition against Yemen without consultation not only with any UN Security Council member but also without consulting Russia and other big players. “The only thing we could say is that the Saudis (and others) have been invited to intervene by President Hadi. But this is a very weak argument. He was elected on a ballot where he was the only candidate, he resigned his office several months ago, and he is now no longer even in Yemen. Thus it is very hard to claim that he has the right to ask for such an intervention. “The major issue now is if the Saudis decide to try a land campaign. If they do, there will be a token presence of Saudi commanders and troops but other people doing the real work. It's hard to see it being a success: If the Pakistanis turn up in Sanaa it will be a medium- and long-term disaster. That won't work for bringing Saudi Arabia the stable pro-Riyadh regime it wants to have in charge. If they send their own troops, it will also quickly transform into disaster since the Yemenis will never accept them. That was Andrew Hammond of the European Council on Foreign Relations, speaking about the cultural and ethnic implications of a potential full-scale Saudi intervention in Yemen.TROIKA REPORT supports a diplomatic settlement as well as the discarding of the use of force for three reasons. Firstly, it is unachievable given the military capabilities, the spirit of defiance and tradition of martyrdom of Yemen’s desert soldiers. Secondly, it will fan animosity and ramp up the hostilities, making it much harder to find a path to a peaceful settlement. Thirdly, direct intervention could incite Iran to go to war with its arch-rival, Saudi Arabia, thus elevating the regional conflict to an all-out war between the Sunnis and the Shiites across the whole Middle East. Such a war would engulf the whole region and have dramatic repercussions outside its geographical boundaries. Moscow has an interest in stability in the region. Russia and other members of the global community just cannot stand idle and watch the conflict deteriorate into a major disaster of almost biblical proportions. The awakening of Iran: Does Russia stand to win or lose? The decades-long standoff between Iran, labeled by Americans as a “rogue state,”and “The Great Satan,”as the religiously conservative Persians have dubbed the United States, may be coming to an end. High hopes have been raised by the tentative agreement hammered out by Iran and the P5+1 grouping of world powers after a marathon of grueling negotiations ended last week in Switzerland. While diplomats and experts are voicing cautious optimism over the chances of reaching an all-embracing agreement on the Iranian nuclear crisis by the end of June, there is a growing understanding that lifting Western sanctions would in the long run make Iran the new superpower of the Middle East. “This is not a question of ‘if’, but a question of ‘when’,”says Andrei Fyodorov, Russia’s former diplomat and political pundit. In his view, the Iranians are cutting corners in their drive to reintegrate into the world economy and global politics, and there is seemingly no way to stop them. Therefore the ongoing debate over the Iranian nuclear issue is quite understandable: The awakening of the sleeping giant of the East would lead to fundamental changes in regional and world politics, and also affect world oil and gas markets, where some would stand to win and some to lose. While the U.S. mainstream media has hailed the event as a victory for President Barack Obama, he is not the only winner. The modest yet crucial advance in the talks is a clear sign of the effective leverage provided to the global community by Russian diplomacy. Washington, in spite of the current clash with Moscow over Ukraine, found it appropriate to praise the constructive role Russia played in achieving the diplomatic breakthrough. “Russia was a very important political guarantee that these negotiations would finish in a positive way. There are a number of benefits for Russia. Politically, there are opportunities to cooperate more actively with Iran on regional problems, including the fight against Islamic State. We could also try to solve, finally, the issues related to the Caspian Sea. From the economic point of view, there are contracts underway worth some 20 billion dollars. Besides, Moscow and Tehran would be wise to harmonize their approaches and join their efforts in finding temporary or final settlements to a wide array of thorny international issues. To name a few: the legal status of the Caspian Sea; future stability in neighboring Afghanistan once American troops are reduced to a limited contingent; the threat of Islamic State to redraw regional boundaries, etc. And yet there are equally firm grounds for remaining skeptical. With the final agreement expected by June 30, many potential pitfalls lie ahead. The deal could be easily torpedoed in the U.S. Congress by the neocons, while the ultraconservative ayatollahs in Tehran may also try to sabotage it. All in all, today’s euphoria is misplaced. The mutual demonization may have ceased for the moment, and the antagonism between the U.S. and Iran may be on the verge of softening, but the process can be still reversed. For its part, Moscow has scored an important point but it remains to be seen how further developments will unfold.